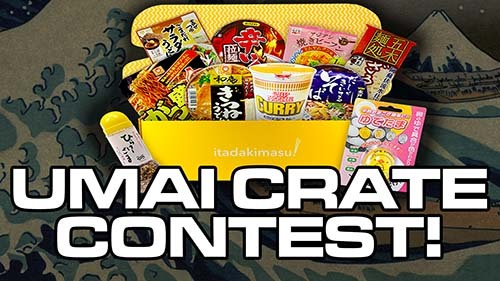 Win An Umai Crate Full Of Ramen From Japan Crate! I’d like to announce a new contest! Japan Crate and The Ramen Rater have partnered to do give away a free Umai Crate to a lucky winner! What’s an Umai Crate, you ask? It’s a monthly box that’s full of neat ramen from Japan! They feature unique varieties from all over Japan plus a bonus item (usually a kitchen implement), a recipe card, and a detailed pamphlet with background information and cooking instructions. Want one? Watch the video below and read on! UMAI CRATE GIVEAWAY CONTEST!! FREE RAMEN!! Check out this video to learn a little more about what’s inside these boxes! Contest will run from October 21st, 2018 until November 4th, 2018. The contest is open to everyone, however there are a few countries they do not currently ship to – however, if you are from one of these countries and want to give your Umai Crate to someone from a country not on the list, that works too! If you don’t win and still want one, you can purchase one here. Use the coupon code THERAMENRATER for a discount!